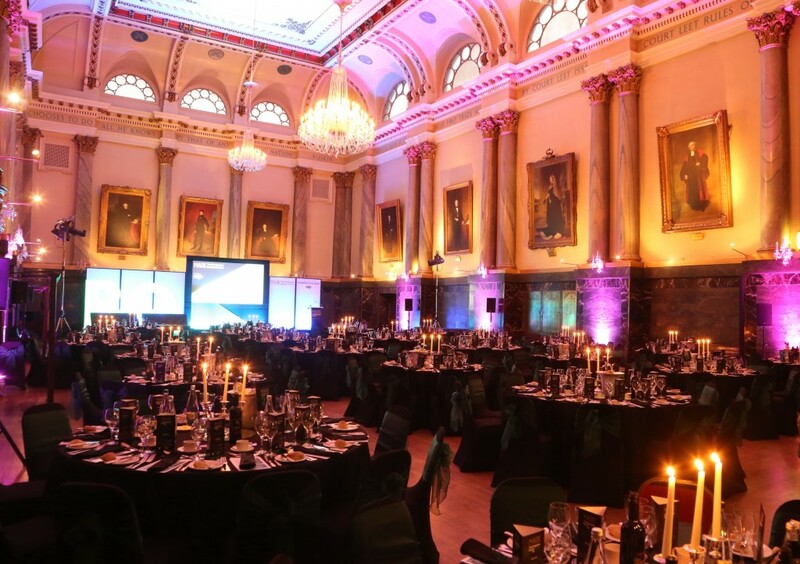 As many of you may be aware, we’ll be spending one of our evenings dining at the Cutlers’s Hall and we thought this would give us the perfect opportunity to tell you more about the history of the Cutlers’ Hall and its associated Cutlers of Hallamshire. Culters’ Hall is the head quarters of the Company of Cutlers in Hallamshire and is a beautiful Grade II listed building in the centre of Sheffield, opposite the equally beautiful Grade I listed Cathedral. Built on the grounds of the previous two Cutlers’ Halls in 1832 at a cost of £6500, the Hall has had several renovations over the past century , many of which have been funded by exiting Master Cutlers to commemorate their time in office. One of the building’s wow factors has to be the Banqueting Hall. Designed by Flockton and Abbott in 1865, the Banqueting Hall has a renaissance feel with marble architecture, columns and ladies’ and minstrels’ galleries to add a feeling of Victorian splendor to any occasion. The third Cutlers Hall was designed by two architects, Samuel Worth and Benjamin Broomhead-Taylor. 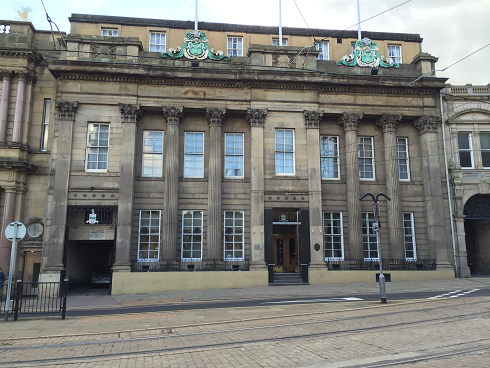 Documents from the time indicate that when the Company of Cutlers first decided to rebuild the Cutlers’ Hall, they asked various architects from across the region to submit their designs for the Company’s approval. Unable to come to a unilateral decision about whether to use Worth’s or Broomhead-Taylor’s designs, the Company commissioned both architects to work together and produce plans that satisfied them both before presenting the designs to the Company of Cutlers. It is believed that the Company decided to act as the co-ordinator and manage the workload as they had done in 1725 but this was proved to be a regrettable mistake. Although they had initially budgeted £4000 for the building of the new Cutler’s Hall, they in fact spent £6500, money which was loaned to them by the Hadfield Family at a rate of 4.5%. The building was technical advanced for the time; it had its own central heating system and gas lighting throughout. Today the Hall houses a selection of old Sheffield knives which are on display as guests walk to the Banquet Hall as well as other artifacts showing Sheffield’s past such as scissors and crafted tea seats. Other pieces include a giant turtle shell; a gift to the Company for the Cutlers’ Feasts of 1773. It started the tradition of serving turtle soup as part of the annual feast. As the Company of Cutlers grew, so did the length of the feast. What used to be a small affair grew to take up several days until more recently, where the feast had now returned to a simple black-tie affair for 400. The Company of Cutlers of Hallamshire was incorporated in 1624 after Gilbert, the 7th Earl of Shewsbury died in 1616 leaving the Company without anyone in control as the Earls had previously been in charge of the Company. After the incorporation in 1624, the Company has since elected a Master Cutler to manage the affairs of the Company of Cutlers in Hallamshire. They took over responsibility for over-seeing every aspect of cutlery production in Sheffield including binding apprentices, registering marks and devising regulations to ensure product quality which ultimately led to the production of Sheffield Steel and ensuring it became a recognizable brand the world over. Today there are approximately 447 members of the Company of Cutlers and they are known as Freemen. Each year they elect the Master Cutler who has to assist them in their duties, 2 wardens, 6 searchers and 24 assistants. The Company of Cutlers is heavily involved in Sheffield life and raises funds for several local charities with the most famous being the Master Culters’ Challenge. The Master Cutlers’ Challenge encourages secondary school children to make as much profit on £25 as possible with the winners winning a 5* holiday. The Challenge offers young people the opportunity to experience enterprise and entrepreneurship as well as develop valuable skills and supporting a good cause. All the money raised is then donated to local charities.